With the story finally getting front-page treatment in the press, Prime Minister Jean-Marc Ayrault is under pressure to explain how – at a time of growing environmental concerns and dwindling financial resources – building a €550m (£445m) airport in a city that already has one is the right course of action. As a former mayor of Nantes, Mr Ayrault is one of the airport’s most vociferous supporters. Protesters have dubbed it the “Ayraultport” in his honour. But he presides over a coalition government whose other main participant – the Green Party – opposes the scheme. To defuse the tension, Mr Ayrault announced over the weekend a moratorium on work at the site. A “dialogue commission” is to be created so that opponents can once again express their concerns. 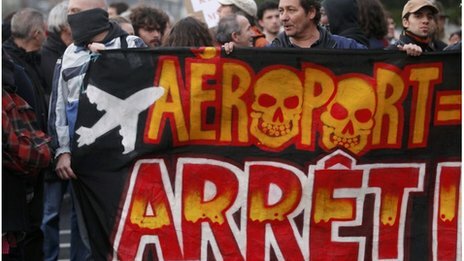 The figures given by the proponents of the airport are hotly disputed by opponents of Notre-Dame-des-Landes, who argue that with proper investment the existing airport at Nantes could be sufficiently enlarged. 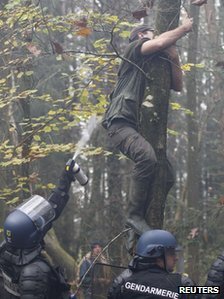 In the fields and woods of southern Brittany, protesters are waging a protracted, dirty and occasionally violent campaign to halt France’s latest “grand projet” – a new airport for the west of the country. 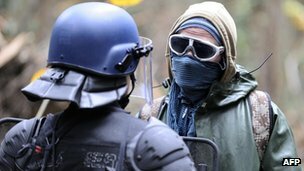 For months activists have been living rough in cabins and treehouses in the countryside 10 miles (16km) north of Nantes, occupying part of the area designated for the Aeroport du Grand Ouest, in the commune of Notre-Dame-des-Landes. A combination of political greens and reds, they say the airport is costly, unnecessary and will do serious damage to the environment. Far better, they argue, to keep the fields for their original purpose: grazing cows. But the Socialist government, backed by the Socialist region and the Socialist-run city of Nantes, is determined to press on. In recent weeks things have come to a head. With the legal process finally exhausted, police have used force to clear out protesters so that the initial phase of work can begin. 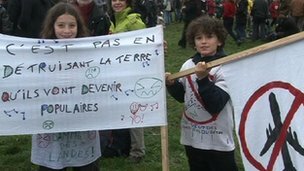 On 17 November, a mass demonstration at Notre-Dames-des-Landes by some 20,000 opponents of the airport provided cover for activists to reoccupy the site and start rebuilding their huts. But now, riot police have moved back in, and there were clashes over this past weekend. Tear gas and rubber bullets were fired and several police officers and protesters were injured. With the story getting front-page treatment in the press, Prime Minister Jean-Marc Ayrault is under pressure to explain how – at a time of growing environmental concerns and dwindling financial resources – building a 550m euro (£445m) airport in a city that already has one is the right course of action. As a former mayor of Nantes, Mr Ayrault is one of the airport’s most vociferous supporters. Protesters have dubbed it the “Ayraultport” in his honour. But he presides over a coalition government whose other main participant – the Green Party – opposes the scheme. To defuse the tension, Mr Ayrault announced over the weekend a moratorium on work at the site. A “dialogue commission” is to be created so that opponents can once again express their concerns. But the government remains adamant: the airport will go ahead. A farming village of 200 inhabitants, Notre-Dame-des-Landes was selected as a possible site for an airport as long ago as the 1970s. Back then, the idea was for a new international hub that would draw traffic away from the two Paris airports. The supersonic airliner, Concorde, would have used it. But over the years the project changed in focus. When it was finally given the go-ahead in 2008, the aim was to provide a new communications centre for France’s fastest-growing region. “The population of western France is getting bigger and bigger, with people moving in for jobs or for the sun. These people need direct routes by air to cities in other parts of Europe,” says Nicolas Notebaert, chairman of the contractor, Vinci Airports. Nantes has an existing airport – Nantes-Atlantique – but according to Mr Notebaert, it will soon be unable to cope with the projected growth in traffic. “What the people of the Nantes region need is a lot of small planes heading to a lot of different destinations. That means many more plane positions and more terminals than the current airport can handle,” he says. Mr Notebaert’s figures are hotly disputed by opponents of Notre-Dame-des-Landes, who argue that with proper investment the existing airport could be sufficiently enlarged. Opponents also question other arguments put forward by Vinci and the government: for example that the current airport presents a noise and safety hazard for the people of Nantes, because most aircraft that land there have to overfly the city. “In 25 years as a local elected official, I never once had a complaint about noise,” says Francoise Verchere of the Left Party. As for the claim that the new airport will bring jobs and growth, campaigners say that after the construction phase the impact will be minimal – with many jobs simply being transferred from the existing airport. According to Mr Notebaert, Vinci’s plans for the new airport will make it one of the “greenest” in the world – with energy per passenger one third of the level at the existing airport. But environmentalists say the whole notion of a “green” airport is laughable. They say that its construction will endanger rare animals like the crested newt, which lives in the wetlands designated to be drained and concreted over. And they believe the “growth-at-all-costs” vision of the world is outmoded and dangerous. “I don’t want Nantes to be some European megalopolis. I just want Nantes to stay as it is,” said Natalie, a young demonstrator at the site. With the airport protests becoming of national interest, Green Party leaders are going through contortions to justify staying part of the coalition. Jean-Vincent Place, who heads the Greens in the Senate, points out that in their pre-election agreement with the Socialists, the airport issue was left to one side. “But it has been very difficult these last few weeks, especially seeing the military-style use of force being taken against the campaigners,” he says. For the constructors Vinci, Mr Notebaert says democracy is at stake. “Our agents on the ground are the ones who are afraid – of the protesters,” he says.